The first violin part for Tchaikovsky's Romeo and Juliet Overture-Fantasy has been edited by Norman Carol, the legendary former concertmaster of the Philadelphia Orchestra, who held the position from 1966 to 1994. Carol's bowings, fingerings and other editorial markings have been added throughout the score. Romeo and Juliet, styled as an "Overture-Fantasy," is a symphonic poem in sonata form with an introduction and an epilogue. The work is inspired by and based on Shakespeare's play, and several of the story elements appear in musical form throughout the composition: the B minor warring of the Capulets and Montagues, the horn and flute love theme (representing Romeo and Juliet respectively), the D major consumation of their marriage, and the suicide of the two lovers with two large orchestra hits with cymbal crashes. Romeo and Juliet was originally met with poor reception, though it is generally considered to have improved considerably after Tchaikovsky revised it two times. 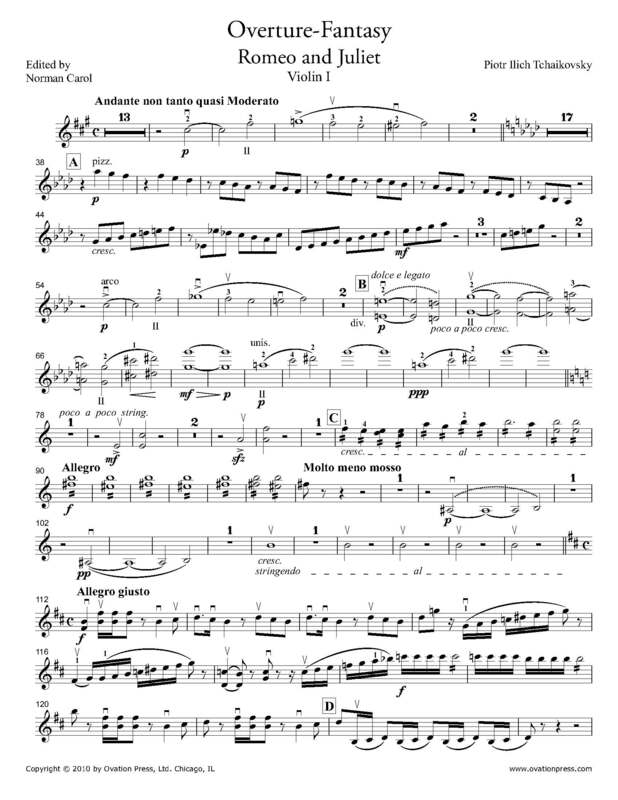 Download and print the score today to gain access to expertly edited Tchaikovsky Romeo and Juliet Overture-Fantasy violin fingerings and bowings from Norman Carol!